Ave Maria Press | e-Book Available — In an engaging combination of personal memoir and biographical narrative, Elizabeth Ficocelli introduces readers to three remarkable women saints who became not only her role models, but also her life-changing friends. Each saint is presented through the prism of virtue – specifically faith, hope, and love – and comes to life vividly through the author’s touching and at times humorous accounts of the poignant lessons she has learned from each. Tender, honest, introspective, and deeply personal, Thérèse, Faustina, and Bernadette: Three Saints Who Challenged My Faith, Gave Me Hope, and Taught Me How to Love provides beautiful witness to the loveliness and wonder of the feminine genius! Elizabeth Ficocelli, writing from the insightful perspective of a convert to Catholicism – a convert who seeks to understand and unpack the mysteries of her own spiritual journey – reminds us in this gem of a book that we should all seek to acquire friendship with the saints and grow in the theological virtues. I highly recommend this book! Prepare yourself. You’re about to meet three women who are remarkable and accessible. Ficocelli bares her heart, shares her life, and weaves in three of the great women saints of the last 100 years. You’ll learn, you’ll laugh, and you’ll walk away changed, with three new friends. 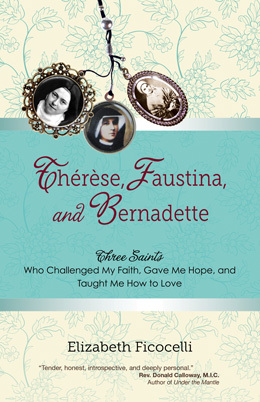 Thérèse, Faustina, and Bernadette is more than a simple recounting of the lives of three spiritual giants. With this book, noted author and speaker Elizabeth Ficocelli shares how the companionship of her ‘journey partners’ has impacted her profoundly. For those of us endeavoring daily along the path to heaven, Elizabeth has unveiled some of the major pieces we need in assembling our own spiritual puzzles. An enlightening read! Elizabeth Ficocelli’s books always engage the reader at once and throughout–and this one is no exception. Here she relates her own coming-of-age story of adult conversion and the vital, active help she’s received along the way from Thérèse, Faustina, and Bernadette, attesting to the reality of the Communion of Saints, and their eagerness to share their graces with us. God’s ongoing plan has led Ficocelli (so far) from being a New York ad exec/control freak, to being a wife, a mother of four boys, and–most unexpectedly–a Catholic apologist. Intertwined with this are short biographies of the three saints, concise readable explanations of each one’s main virtue, and what they have meant and given to her at different times when she’s needed it. She looks at her life, the good and the bad, with both humor and great candor, and at the saints’ lives with unsentimental pragmatism. This is classic Ficocelli–clear, straightforward, and thought-provoking. Susan Heybour O’Keefe, author of the picture books One Hungry Monster and Hungry Monster ABC, and the Catholic best-selling picture book What Does a Priest Do? What Does a Nun Do? In openness and candor Elizabeth Ficocelli reveals her personal experiences of living the challenges of her Catholic Faith. Her peace and joy come in meeting these challenges by embracing the cross though the grace of prayer and the Sacraments as well as following the example of new found friends, her favorite saints. This book will help anyone who also experiences challenges in life by the assistance of some wonderful friends!